HP doesn’t stand idly watching other manufacturers launching one curved ultrawide monitor after another. They have their own arsenal of ultrawides that are ready to take on the competition. The Envy 34c is one of them. This monitor is HP’s take on what a 34-inch ultrawide monitor should be. It looks attractive and has plenty of trinkets that people love. 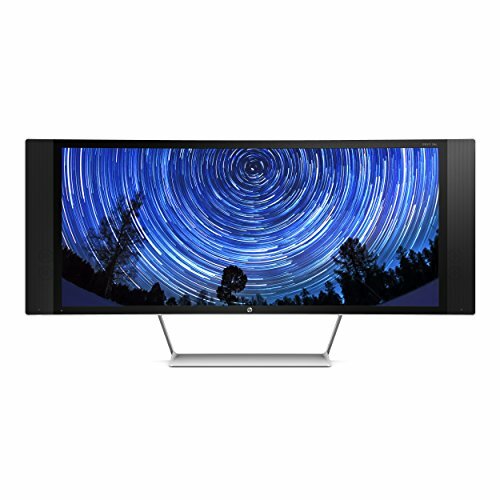 Let’s find out more about this monitor and see if this is the one for you. The Envy 34c uses a 34-inch VA panel with 21:9 aspect ratio and 3440×1440 native resolution. The panel has 350 cd/m2 maximum brightness covered with a semi-gloss coating. The VA panel has 3000:1 Static contrast ratio with a dynamic ratio up to 10m:1. These numbers are higher than the ones you’ll find on monitors with IPS or TN panels. HP uses a curved panel with 3000R curvature radius. That means if you line the panel side by side it will make a circle with a 3000mm radius. Measuring at 18.79 x 7.76 x 37.44 inches, this monitor weighs 21.6 lbs with the stand attached. The I/O inputs available are 2x HDMI, 1x DisplayPort, 1x MHL, 2x downstream USB, and 1x upstream USB. The Envy 34c is equipped with a pair 6-Watt front-facing speakers. When running, the monitor draws 61-watt of electricity. It’s not the most power-efficient monitor, but not the most power hungry too. Included in the box are one power brick, 1x DisplayPort, a VESA adapter. You also get cables for HDMI, MHL, and USB. Warranty is only one year, which is a shame on HP. Other manufacturers are giving three years warranty on parts and labor. From the front, the Envy looks simple yet elegant. The bezels are not flushed with the screen, so you can see them clearly when the monitor is off. The side bezels add 4.5 inches in total, increasing the monitor’s width to 37.4 inches. Better measure your desk again and check if it’s big enough to handle this big boy. The thick side bezels are clear giveaways that this monitor is not made for a multi-monitor setup. HP designs the Envy 34c as a lone wolf that will solely dominate your desk. Will that ever be a problem? Most likely no. The size of a 34-inch monitor should not be taken lightly. It’s massive. There are nothing but the speakers on the front part of the monitor. The back portion is covered in white plastic with a bulge on the lower half that adds to its thickness, but not to the detriment of the monitor’s aesthetic. The volume control for the speakers is located under the left bezel. It’s a rotating wheel that’s you turn when you want to crank the volume up or down. HP could use more common sense when designing that thing. You have to turn it a lot to get any noticeable effect on the volume. The Envy 34c is supported by a simple stand made of cast aluminum. It’s connected to the very bottom of the monitor. The stand only has tilt adjustment — 2 degrees down, and 25 degrees up. That’s right, no height or swivel adjustment. The lack of swivel adjustment is not rare, but no height adjustment? Make sure your chair has height adjustment on it, so you can always have your eyes level with the monitor to avoid neck strain. It’s a good thing the Envy has a VESA adapter included so that you can mount the monitor on a monitor arm with a better range of adjustability. The control buttons are all located on the back side at the far right. The buttons are clicky and have good feedback. HP lines the power button and I/O ports above the stand mount. The rear-facing ports make plugging peripherals and cables easier compared to ports that face downward. One of the HDMI ports supports MHL which stands for Mobile High-definition Link. HP is kind enough to include an MHL cable in the package. MHL is handy when you want to view the content on your phone or tablet on the 34-inch screen. When you have photos and videos that you want to show everyone, just hook up the cable, and everyone can see how cool your photos and videos are. The HP Envy 34c comes in a large box with rubbery foam protecting the monitor and everything else in it. Each accessory comes in its own small box which makes it easy to locate what you need to complete the setup. The first thing you need to do is attaching the stand. Snapping the stand on the bottom of the display is simple. You do not need any tools to do it. After connecting the power brick, and plugging in the monitor, you can turn the monitor on and pop up the OSD. There are 11 menus available when you turn on the OSD: Brightness, Color Control, Input Control, Image Control, Audio, PIP Control, Power Control, OSD Control, Management, Language, and Information. Frankly speaking, you don’t need to do much of anything here. Straight out of the box, the color quality of the Envy 34c is more than okay. It’s already calibrated on the sRGB mode, and it is spot on. Colors and saturations are accurate with contrasts that will satisfy most applications. Compared to monitors with IPS or TN panels, the contrast that the Envy 34c can produce is miles above. The images almost look like 3D. Even if you leave the factory settings as they are, you will be pleased with how everything looks on the screen. The only thing you may want to tinker with is the brightness so that it fits with whatever applications you’re using. If you ever want to play with the settings, you should start with the Custom RGB to adjust the white balance to something more neutral. We recommend tuning the RGB sliders to 255, 228, and 232 respectively. If you do a lot of photo editing, this is the right first step to do. As we mentioned above, the image quality of the Envy 34c is gorgeous out of the box. Great colors, spot on saturations, and excellent contrast that make images pop. This is true when you sit right in front of the monitor or when you view it at an angle. Now, VA panels are not known for their wide viewing angles, but the VA panel HP uses in the 34c is better than its kin. Even though you can still see brightness reduction when you check out the sides, the details are still there. The fact that this is a curved screen monitor helps too. The curved screen is one of the key selling points of the Envy 34c. Thanks to the curve, everything on the edges of the screen is not at such an acute angle from your eyes. Suffice to say that a curved monitor is not just a gimmick; It’s a feature. As expected from a monitor with VA panel, you can hardly see any backlight bleed with naked eyes. Even when you are watching a movie or playing a game with really dark background, there is no visible glow or hotspot. Every inch of the monitor looks uniform no matter what your screen is currently displaying. Please note that you need to use DisplayPort if you want to enjoy the 3440×1440 resolution at 60Hz. Somehow, using HDMI cuts the refresh rate to 30Hz instead of 50Hz like you normally get with other monitors with both HDMI and DisplayPort. You can enjoy 60Hz on HDMI by scaling down the resolution to Full HD or 1920×1080. A lot of people who connect their game consoles to the Envy prefer to set it that way. If you’re using a Mac, you can get a Thunderbolt to DisplayPort cable to get the best out of this monitor. A Thunderbolt port is basically the same as Mini DisplayPort, so a cable marketed as Mini DisplayPort to DisplayPort cable works too. You won’t have a hard time finding such cable. Given that it has a 34-inch panel, it’s unsurprising how much screen real estate the 34c has to offer. This is one of the reasons why it’s ideal for professional works. It’s screen size and 21:9 aspect ratio makes working with two or three applications at once a breeze. Yes, it’s very good. Whatever documents you’re working on you can see that the texts are sharp and easy to read. Yes, even when the documents are written in 8-point letters, they will still look sharp. This, however, only applies if you’re running the monitor on DisplayPort. It’s a whole different story if you’re using HDMI. On HDMI, the small text will look smeared and unreadable. If you’re running Windows, you can improve the text clarity by tinkering with the ClearType settings in the Control Panel. Another reason why the Envy is ideal for work is the semi-gloss anti-glare coating. Some may argue that semi-gloss coating is worse than matte coating in preventing glare, but that’s not the case here. Even if you’re working in a well-lit room for hours and hours, the display is still easy on the eyes. Watching movies on this monitor is no less than a treat. Thanks to the amazing contrast ratio that VA panel has and also the deep blacks it can produce. The Envy 34c isn’t too shabby for gaming too. Despite its 8ms response time, you can still enjoy many AAA gaming titles with an amazing level of immersion. The 34c also supports FreeSync that can eliminate screen tearing and stuttering. FreeSync synchronizes the graphic card’s rendering with the monitor’s refresh rates. That way the monitor won’t try to show information from multiple frames in a single draw. Granted, a monitor with only 60Hz refresh rate may not need that feature as much as the ones with 100Hz or 144Hz refresh rates. But it’s a very useful feature to have nonetheless. For gaming, one thing you want to do is to turn on the Video Overdrive. You can enable it from the Image Control menu on the OSD. Video Overdrive prevents motion blur and ghosting on fast-paced games. Too bad Overdrive doesn’t help with the input lag. At 28 milliseconds, your fancy gaming mouse and keyboard are useless with this monitor. Serious gamers will do better with the ASUS ROG Swift or Acer Predator. This monitor is for those who prefer to play casually. There is no doubt that one day ultrawide monitors will reign supreme. Whatever your need is, you’ll do well with the Envy 34c on your desktop. The ultrawide aspect ratio combined with the sheer amount of real estate a 34-inch monitor offers is enough to immerse your whole vision. You don’t need a two or three monitor setup with this. It’s true. Once you use it, an ultrawide monitor like this will become something that feels natural to you. HP includes six color presets with the Envy – Gaming, Movie, Photo, Text, Custom, and HP Enchance+. As with any other monitor, you may want to play with settings for a bit to find that sweet spot. Two notable features are the Envy has are Picture in Picture (PIP) and Picture by Picture (PBP). With PIP you can have two windows from two different outputs at the same time with one set as the inset. With PBP, you set the windows side by side, and each will have 16:9 aspect ratio. It’s a feature that works well for multi-tasking and collaborative work. With front-facing speakers, the HP Envy 34c sets itself apart from the rest of the crowd. It’s so logical to put the monitor speakers at the front, yet many manufacturers prefer to put them on the rear. The speakers on the 34c are only 6-watt, but since both of them are pointing at you, the result is quite impressive. HP also adds DTS Audio Enhancement on the speakers. It makes the bass and soundstage more pronounced. These speakers are better than the average built-in speakers in competing monitors. The sound quality remains excellent when you crank up the volume all the way, free from distortion. These 6-watt speakers will never replace a dedicated sound system, but for all intents and purposes, they will serve you very well. Have we mentioned that the HP Envy 34c comes with a remote? That’s, right. HP includes a six-button remote in the package. HP nails it with this remote. It looks sleek and functions well. The little bugger has six buttons on it: power, OSD nav, input selectors, mute, plus and minus keys. Pressing the OSD navigation button opens the OSD in oversize mode. All of the texts look much bigger and easy to read when you’re lazing about on the couch far from the monitor. If you want an ultrawide monitor that can deliver stunning colors and contrast when you stream movies, the Envy 34c is a fascinating monitor to have. It’s also an excellent monitor for working on multiple documents and spreadsheets at once. The ultrawide display provides massive real estate that’s better than having two or three monitor setup. HP markets the Envy 34c at a very appealing price point. If you want do jump into the ultrawide bandwagon without spending an arm and leg, the Envy 34c is a good choice. Still, you need to ensure that your chair has height adjustment. You absolutely need it unless you enjoy massaging your neck at the end of the day, every day.